A stupa (literally “hair knot”) was originally a monument erected over the relics of Gautama Buddha and other great saints. Today stupas are highly symbolic structures that are the focus of devotion in Buddhist monasteries or temples. Stupas may contain sacred texts and other sacred objects. One Buddhist text recounts that Gautama Buddha told a disciple that stupas should be constructed not only as monuments to the dead but as monuments to the living—to a Buddha and “a true hearer” of a Buddha. Thus the stupa is more than just a memorial for the worship of Buddhas or saints; it is a supreme symbol of the path of the attainment of enlightenment, the goal of every Buddhist. The component parts of the stupa symbolize the qualities or disciplines that produce the awakened state of mind. Eight different types of stupas commemorate the eight major events in the life of Gautama Buddha and stupas have been erected at sites that played an important role in Gautama’s life. 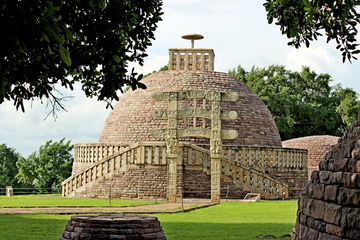 A stupa usually has a hemispherical or cylindrical shape; the basic architectural form takes on special features in different countries throughout Asia. 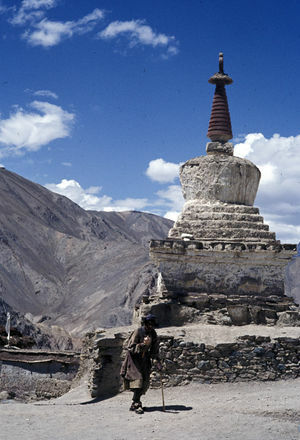 In Tibet stupas are called chötens, or chortens. The cubic forms of the lower storeys correspond to the element ‘Earth’, the round central part to the element ‘Water’, the conical (gilt) upper-structure to the element ‘Fire’, the umbrella above it to the element ‘Air’. The flaming drop of the element ‘Ether’ rests on the vessel with the ‘Elixir of Life’, which crowns the honorific umbrella. ... a human figure in the posture of meditation hidden in the stupa, the crossed legs in the base, the body up to the shoulders in the hemisphere, the head in the harmika [kiosk or altar-like structure at the top]. This also corresponds to the psycho-physiological doctrine of the centers of psychic force [chakras] which are located one above the other in the human body and through which consciousness develops in ascending order.... The crown chakra is symbolized by a dome-shaped or flame-like protuberance on the head of the Buddha, and by the cone-shaped Tree of Enlightenment which forms the spire of the stupa. In innumerable texts the Dharma is equated with light: the Buddha’s Awakening is an Illumination, and his preaching of the Dharma is an irradiation of the worlds. The stupa as Dharma is thus a source of light; it is a Beacon of the Law, and in many places it has been a common custom to light up the stupa with a profusion of lamps.... The stupa propagates the doctrine; it shines with the radiance of the Dharma, illuminating the four quarters. The building of a stupa is a renewal of the preaching of the Dharma. According to a Tibetan text, the stupa is built to allow all creatures to see the Buddha, to hear the Law spoken once again, and to reverence the Community (sangha) which has received the Law and faithfully transmitted its teachings. Gautama Buddha said that wherever there would be a stupa, there the dharma would be preserved. This is so because of the geometric forcefield: the lines of the stupa itself are fohatic keys for the sustainment of the matrix of the dharma in matter. Just like the pyramids and the gothic cathedrals, the stupa holds a certain energy. 1984 Pearls of Wisdom, vol. 1, Introduction. Elizabeth Clare Prophet, December 4, 1977. Elizabeth Clare Prophet, November 5, 1981. ↑ The Encyclopedia of Eastern Philosophy and Religion (Boston: Shambhala Publications, 1989), p. 340. ↑ Lama Govinda, Foundations of Tibetan Mysticism (1960; reprint, New York: Samuel Weiser, 1969), pp. 185–86. ↑ Lama Govinda, Psycho-cosmic Symbolism of the Buddhist Stupa (Berkeley: Dharma Publishing, 1976), pp. 84–85. ↑ Adrian Snodgrass, The Symbolism of the Stupa (Ithaca, N.Y.: Cornell Southeast Asia Program, 1985), pp. 366, 370–71. This page was last modified on 7 February 2017, at 11:00.